Insert the front wheel back onto the bike. 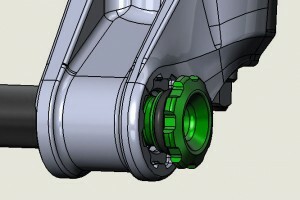 Make sure the hub fits into the drop outs, then insert the thru axle from the non-disc side. 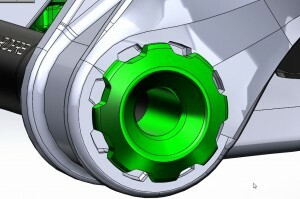 Slide the axle until it makes contact with the threads of the axle bolt on the disc side. 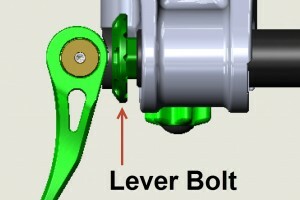 Rotate the axle lever clockwise until there is a small gap between the lever bolt and drop out on the non-disc side. 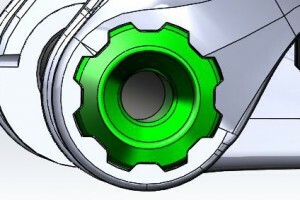 The axle bolt should sit flush inside the grooves of the lower. If the axle bolt is not sitting inside the grooves release tension on the axle and line up the axle bolt so that you can lightly press it into the grooves. The axle bolt will secure itself when you tighten the axle again. 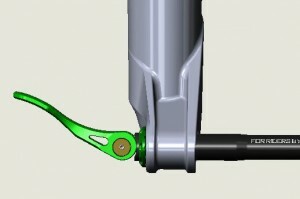 To secure the axle, position the lever in the open position. When you flip the lever half way you should feel resistance and the lever bolt should be touching the drop out. Flip the lever to the closed position by hand strength only. The lever should feel very secure. DO NOT USE ANY TOOLS FOR LEVERAGE. 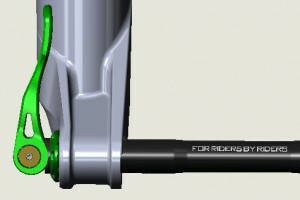 If there is too much or too little resistance adjust the axle bolt on the disc side. Unthread the axle 3 full turns then push the axle to the drive side. This will push the axle bolt out so you can adjust it. If the axle has too much tension then turn the axle bolt counter clock wise. If the axle did not have enough tension then turn the axle bolt clock wise. Rotate axle lever clockwise again and secure lever until there is proper tension in the closed position. Remove bike from stand. With the front brake on, lightly rock the bike back and forth to ensure the headset preload is at the appropriate torque value. THERE SHOULD BE NO PLAY IN THE HEADSET.